That’s a route that The Juggernaut, a new pay-to-play publication targeted at the South Asian diaspora, is going down now. 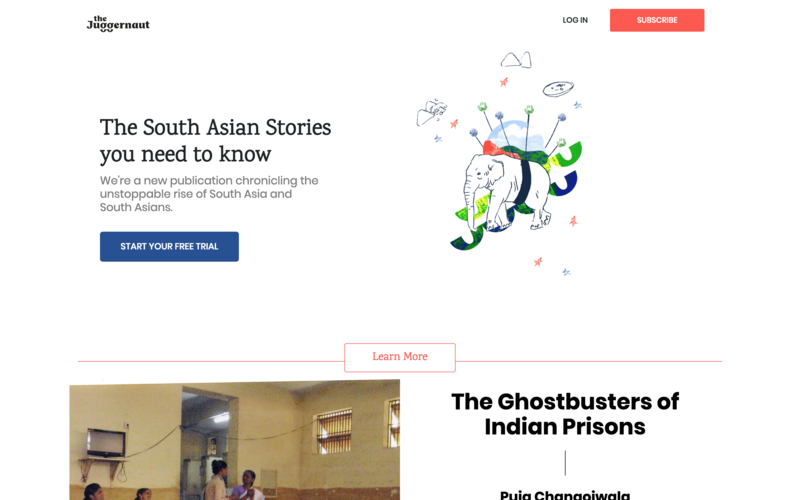 The company is part of the current Y Combinator cohort and is looking to make a mark by giving a voice (and insight) to the South Asia diaspora without relying on advertising. There are already a collection of member-based media services that go after the tech audience — think The Information, Stratechery, The Ken in India… even TechCrunch’s own Extra Crunch — from which The Juggernaut is drawing inspiration, but its play is more akin to The Athletic, the sports-focused publication that graduated the YC program nearly three years ago. Sur’s journey into media, and The Juggernaut, started with her InkMango newsletter last September. After racking up “thousands” of subscribers in a few months, she decided there was enough potential in her storytelling niche to expand into a full-blown publication. The newsletter remains and it is free. The focus is initially on culture, with the primary audience U.S.-based readers with a connection to South Asia; however, that’s likely to expand as the publication grows, Sur said. “We want to hire another editor to expand and that might mean that we expand that output, but we still believe that content can be overwhelming so we’re not actively trying to do that. We’re trying to tell untold stories, and that could be many mediums, so we’re figuring out other formats we should be in,” she explained. You can find out more about The Juggernaut at its website (here). The publication offers a one-week free trial, although that does require credit/debit card details upfront.